We are all writing so much now and for so many different reasons. But no matter what level your writing skills are, an online tool is the easiest way to correct your grammar, spelling and punctuation for any form of writing, from blog posts to books. Word processors such as Microsoft Word do a very poor job. They can only perform a simplistic spell check and rarely find anything more than the most basic grammatical errors and do not examine sentence structures. There are many online grammar checking tools that do a much better job of offering you suggested corrections. Some even give you an explanation or examples of grammatical rules to help you correct your texts. If the English language is not your mother tongue, using online tools to check your English grammar and find any spelling mistakes is always good practice. For students, an online spelling and grammatical check is the best way to help you check your writing assignments, papers and essays. You haven’t got money to burn, so using a free online grammar checker is the most practical way to improve your writing. All of the grammar correction and spell checker tools listed below are available for free. However, many offer a premium version with a lot more features and no restrictions. If you are an author, content writer or pro blogger, you will probably need to consider a premium tool at some point that will better suit your workload. So what are your choices for a free grammar check tool? There is no doubt that Grammarly is one of the most popular grammar tools. Since it began in 2009, it has become a favourite app for writers. For many, it is the best English grammar checker of them all. It has so many ways to check your writing. You can use the editor, connect to Word and Google Docs as well as the different browser extensions. There is also an iOS app. If you are looking for an advanced level grammar tool that checks your text for such elements as run-on sentences, incorrect pronouns, misused words, offers synonyms and gives you suggestions to improve your writing, this is one of the best tools you can use. If you are an author or long form content writer, Prowritingaid offers so many different ways to analyse your long texts and documents. It does far more than simply giving you a grammar suggestion list. I use it all the time to find ways to improve my writing because it is without a doubt, the best grammar checker for long-form writing. What I like most is that I can really investigate my sentence patterns and structure and find better ways to make my writing much clearer and more effective. There are 25 different reports to analyse your writing and make sure it is perfect and error free. It works with both Windows and Mac, with Word, Google Docs, Scrivener and has a Chrome extension. Take a look at ProWritingAid in action. So simple and easy to use. Ginger Grammar has been around for a long time now and is a favourite of many writers. It will find your spelling and grammar errors so you can quickly fix them with one click. With the browser extension, you can correct your mistakes anywhere. It is a robust grammar checker app that is a very accurate sentence checker and is perfect for working writers and students alike. Take a peak with this video to show you how fast and accurately Ginger Grammar works. This is one of my favourite free grammar tools. The Hemingway App is just so easy and simple to use. Just go to the website and paste your text into the editor. I call it my quick passive killer. If you have a habit of using the passive voice too often, this grammar checker app will find it for you so you can change your text to use much more direct active sentences. Read our review of the Hemingway app. Language Tool has one very big advantage. You can check more languages than English. The free version offers a generous 20,000 character limit as well as access to check your German grammar too. You can also get a Chrome extension for free. Very much worth a look. 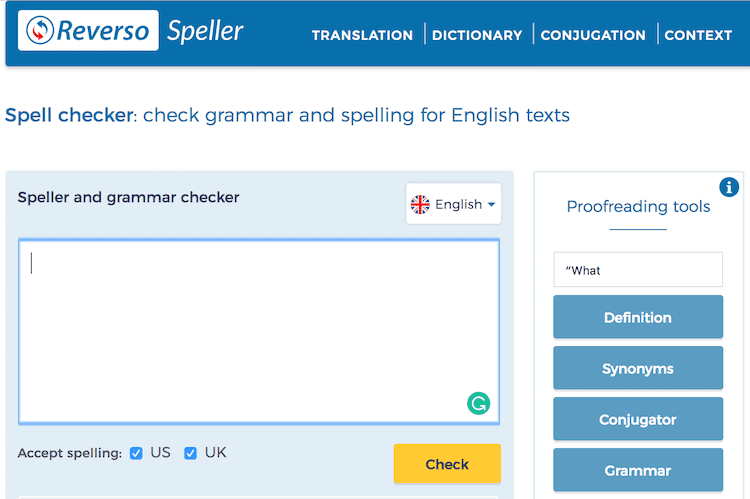 Gradeproof is an online grammar and spelling checker. It works with Google Docs, Microsoft Word, iOS, and on the web as a browser extension. Like similar grammar checkers, there is a free and a premium option. 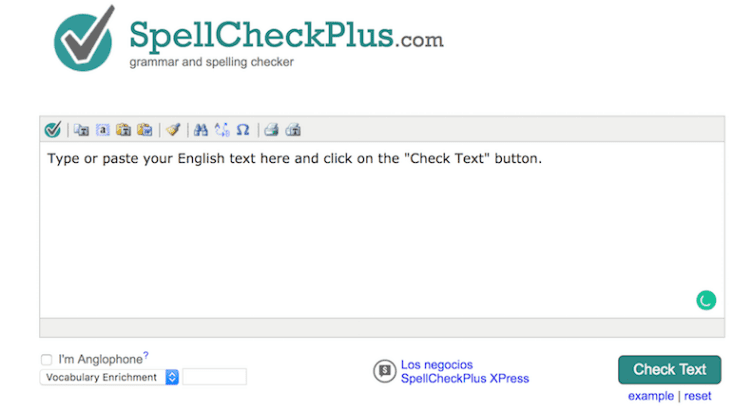 With the free version, you get spelling check tools and grammar checking plus a custom dictionary. If you only need the basics in a grammar checker app, it could be a good choice for you. What makes After The Deadline different is that it is free to use open source software. It is available to download for Chrome, Firefox, WordPress and Open Office as well as other applications. I haven’t tried this software, so I can’t make any recommendations about how well it finds grammar mistakes. But if you are looking for a truly free solution, this one might be for you. Unlike many other free apps, with Grammar Lookup, there seems to be no limit on the number of words you can check. I pasted 3,000 words from a book manuscript into the text box, and the app started checking for grammar, spelling and punctuation errors. If you’re looking for a totally free grammar app with a generous word limit, this one is well worth trying. Another good free grammar site. Just paste your text into the Grammar Check editor and that’s it. Nothing fancy, but if all you want to find are basic grammar mistakes, this app will work fine for you. Another easy to use online application. When I tested Online Correction, it found some spelling and grammar errors as well as some typographical points. While it is an advertising-supported tool, it is not bad at all. I pasted around 3,000 words which the tool analysed very quickly. Another advertising supported tool. But Spell Check Plus handled my 3,000-word text with ease. It did a decent job of finding spelling error corrections and some punctuation errors. Useful for a quick check of a short article or essay for students. Paper Rater is definitely aimed at students. I had to cut back my 3,000-word text to around 1,500 words as there is a word limit restriction on the free version. However, it produced a detailed report, but it was a little slow compared to other similar apps. Reverso is best known as an online translator. However, it has a grammar and spellchecker as well. It is quite basic though, with a very small limit of only 600 characters. Not enough to check very much at all apart from perhaps short social media posts. There is always a price that you pay for free. All of these apps above are free to use. Some are cut-down and restricted versions of a premium app and others are heavily advertising supported. Choosing the best grammar checker for your needs will mean that you will have to check how well each one performs for you. For students, there are many apps that can help your writing as long as you can ignore the ads. They might prove to be exactly what you are looking for in a writing checker. Look for apps that allow you a reasonable and fair word limit though. If you are restricted to less than 1,000 words, it will not help you a great deal. For writers, bloggers and authors though, I would have to say from experience that Grammarly, Prowritingaid and Ginger Grammar are by far the best three choices. The choice between the free and paid versions of the three will depend on how much writing you do, and if you are monetising your writing. For professional online writers and also authors, you might need to consider a premium version at some point in time. But free or paid, there are plenty of options for you to choose from if you are looking for a grammar checker app or an online writing tool. I really liked Grammarlookup, it’s great for improving my writing style. Thanks for listing all of them. Thank you so much for reviewing this kind of stuff very helpful. Grammarly is so American I need an English spellcheck and grammar app. Is there one? Thanks for the article, your article helps to write the perfect grammar in the content. Thanks for sharing.